Ft Lauderdale is the gateway to the Islands of the Bahamas. Due to the lack of local charter boats in the Bahamian islands, the best way to sportfish and cruise around in the islands is to charter a boat from Fort Lauderdale. Between the skyscrapers of downtown Fort Lauderdale and the Grand Bahama Bank lies Bimini, the island in the ‘Stream. The Gulfstream washes right past Bimini, keeping its coral reefs warm and basically serving as an underwater highway for everything from “grander” Blue Marlin to schools of freewheeling bottlenose dolphin. Price Per Day = $2,800.00 plus fuel with 30-Day Cancellation or deposit not refunded. Everything included except Hotel, Fuel, Customs Clearing, Food, Drinks, and Gratuity. Only 50 nautical miles from the South Florida coastline, Bimini is well-recognized for its emerald waters, pristine beaches and abundance of marine life. Just a few miles long and a few hundred yards wide, you won’t be finding strip malls or other signs of civilization. Its location makes Bimini a prime diving and fishing destination. Despite its proximity to Florida, Bimini is truly another world. Bimini can rightfully stake its claim as one of the birthplaces of modern sportfishing. When he wasn’t spending time in Cuba or Key West, Ernest Hemingway was fishing the waters of Bimini aboard his famous Pilar. As a matter of fact, the International Game Fish Association, the IGFA, was established in Bimini. One of the best times of the year to visit the Bahamas is in the summer when the seas and weather are most favorable. 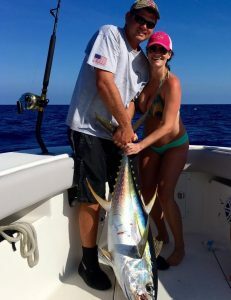 The Bahamas offers a variety of fishing that is nearly endless, ranging from Snapper and Grouper on the reefs to giant Tuna and Marlin offshore. Dolphin, Spearfish, Wahoo, Amberjacks, Sharks, Barracuda, Sailfish, White Marlin and Blue Marlin are just a handful of fish commonly caught in the Bahamas. If flats fishing is your game, arrangements can be made for local guides to put you on your quarry. It is the trip of a lifetime and well worth the cost. Our minimum trip is three days and is perfect for the Islands of Bimini and Freeport, although the outer islands, also known as the family islands, offer a unique experience for those who have the extra time to explore a more low-key and less-traveled part of the Bahamas. For more than 16 years, Captain David has been traveling to the Bahamas on either weekend getaways or sportfishing expeditions. For three years, he lived aboard a charter boat in Bimini working as a mate full-time to learn every fathom of the surrounding waters. Whether island hopping or participating in the prestigious sportfishing tournaments held in the Bahamas, the Lady Pamela II is the right choice for an unforgettable Caribbean experience. Come join us! Big Game Species: Mahi, Sailfish, Tuna, Kingfish, Wahoo, Bonita, Cobia, Amberjack, White Marlin, Sharks, Barracuda. At night, we bottom fish for snapper and grouper.